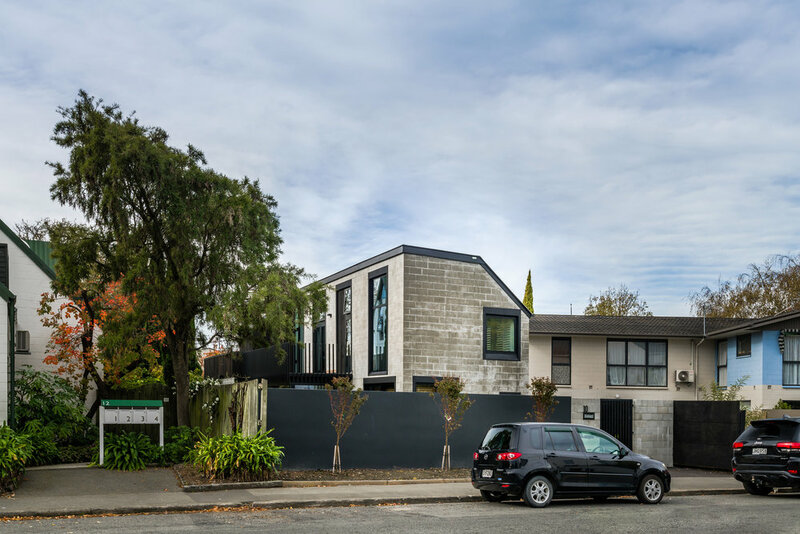 The original concrete block-clad house was designed in the early 1980’s but suffered structural damage after the 2011 Christchurch earthquake. The house sits on a tight CBD fringe urban site with street frontages to both ends. Our design intent was to reinvigorate the dilapidated exterior but maintain a certain respect and homage to the existing exterior fabric and improve internal special awareness. 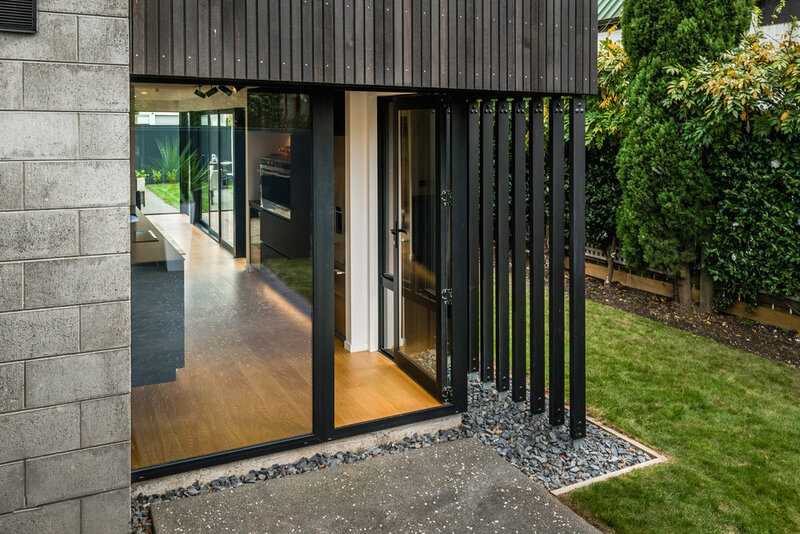 The unobtrusive introduction of dark stained vertical cedar, timber slats and powder-coated steel balustrades provide subtle enhancements. All window/door joinery are replaced with new black aluminium joinery. As this is a compact executive town house, spaces were tight hence why the existing closed in staircase was replaced with a light floating open-tread arrangement which allowed expansion of the living area. The kitchen was redefined with additional space and detailed organisation creating a comfortable and visual passage framing the morning courtyard. Interior-exterior flow is enhanced by the opening-up of the living area to a north facing courtyard creating additional natural light. The media room serves as an extension of the living area via a large new cavity slider. First floor improvements include a new master bedroom ensuite and wir carefully designed within a compact space. Also, a total rearrangement of bathroom and hallway locations allowing the addition of a separate study. 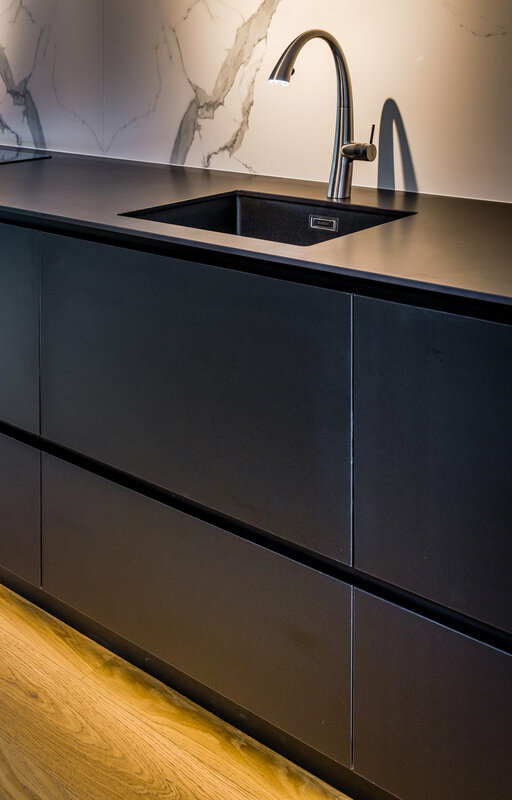 Interior décor treatment included new timber floor to most of the ground floor creating a sense of warmth in contrast to the chilled concrete block exterior. Rather than demolition and building new it’s pleasing our client choose to ignore the financial benefits and move forward with the major repair and alterations which contributes to a positive sustainable approach and makes use of renewable natural materials with lower embodied energy rather than synthesized products.